I’ve often found Gary Oldman a shameless scenery chewer. Villainous roles were especially problematic; you could actually see Oldman twirling his mustache, metaphorically speaking. 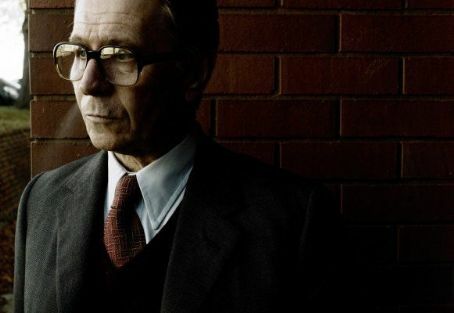 2011’s “Tinker Tailor Soldier Spy” gave us a more settled, thoughtful Goldman, who portrayed John LeCarre’s good gray spookmaster George Smiley with an admirable degree of restraint. Now, in “Darkest Hour,” Goldman tackles the iconic role of Winston Churchill, and it’s a match made in heaven. Sir Winston was, after all, no slouch at scenery chewing; yet Oldman’s performance here is subtle and balanced, a deft blend of bombast and inner activity. It’s a performance of such insight and power — abetted by David Malinowski’s spectacularly effective makeup design — that it immediately propels Goldman into the front ranks of this year’s Oscar contenders. Joe Wright’s film centers on one month, May of 1940, when the long-out-of-favor Churchill was elected Prime Minister after the collapse of Neville Chamberlain’s ineffectual government. The P.M. is faced with seemingly insurmountable problems. The Nazis have taken over much of Europe and are pounding the British army at Dunkirk. If those 300,000 or so soldiers are captured or killed, it will leave Great Britain defenseless. Voices within his own party are urging Churchill to sue Hitler for peace. It’s the only way to escape a bloodbath and an armed invasion. There’s enough to admire in Dito Montiel’s “Man Down” that the film’s final reveal — a big fat slice of narrative cheese — feels like even more of a con job than it already is. Montiel’s screenplay (with Adam G. Simon, who came up with the story) offers no fewer than six different “realities” for its Marine protagonist, Cpl. Gabriel Drummer (Shia LaBeouf). The first of these realities unfolds in a post-apocalyptic near future. Here Gabriel and his Marine buddy and best friend Devin (Jai Courtney) pick their way through the ruins of an American city. Bearded and dirty, they are looking for Gabriel’s young son John, who may be the captive of a group of feral survivors. There are flashbacks to Gabriel’s peaceful home life with his wife Natalie (Kate Mara) and little John (Charlie Shotwell). Gabriel will soon be shipping out, and he spends as much time as possible with his son. They even come up with their own military-style code words for “I love you”: Man Down. Other passages are devoted to Gabriel and Devin’s basic training under the demanding Sergeant Miller (Tory Kittles), a sado-maso experience that will turn them into efficient fighting men. One of the movie’s realities takes place in a dusty Marine outpost in Afghanistan where Gabriel is being counseled by Peyton (Gary Oldman), a military shrink. It appears that Gabriel has undergone a traumatic experience — and yet another “reality” depicts the day that Gabriel and Devin’s unit was ambushed by enemy fighters. Despite the overwhelming evidence, there is no rule that big summer blockbuster films have to be insufferably dumb. 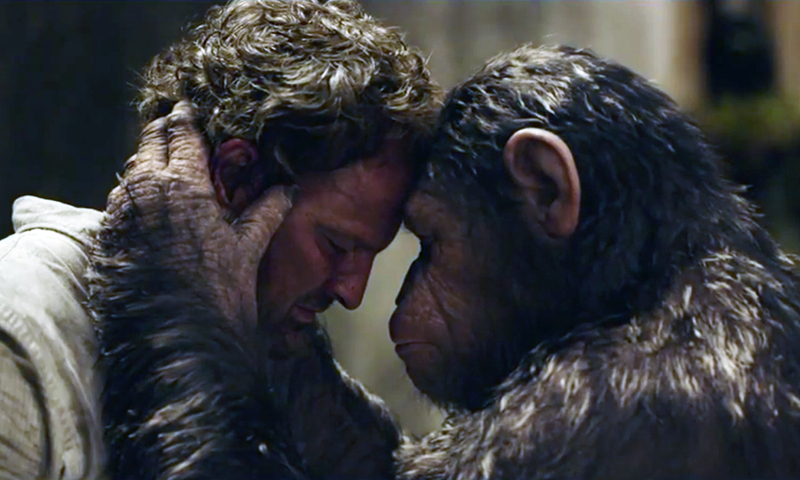 “Dawn of the Planet of the Apes” is actually pretty smart. Oh, not in its plotting, which is all too familiar. Or in the acting from the “human” cast, which is perfunctory. But in creating a world 10 years after the great ape revolution depicted in “Rise of the Planet of the Apes,” director Matt Reeves (“Let Me In,” “Cloverfield”) and his huge team (the closing credits feel as long as the rest of the movie) have given us a vision that is part Eden, part sci-fi dystopia and populated with monkeys who at their best generate real emotions. These apes eschew the technology of the humans who once persecuted them, but they do make their own weapons of wood and stone. Most communicate through sign language (we get subtitles), though Caesar and a few other chimps have learned to speak. They create their own versions of totem poles (assemblages of sticks and animal bones) and some of the females even wear rudimentary jewelry. Gary Oldman is often described as an actor’s actor…which in his case apparently means an incurable ham. Oldman’s career is heavily weighted toward over-the-top, push-too-far performances. Sometimes this is forgivable, particularly when he’s in a bad movie and his fierce scenery gnawing is the only remotely entertaining thing in sight. Too often over the years, though, I’ve found him to be a jarring pothole in a movie’s narrative highway. Now I can happily report that in “Tinker, Tailor, Soldier, Spy” Oldman gives a marvelously restrained, subtle and carefully modulated performance. He plays British spymaster George Smiley, the owlish Cold War protagonis of several John LeCarre novels — a role essayed by Alec Guinness in the 1979 PBS adaptation of “TTSS.” And he is quietly wonderful. “KUNG FU PANDA 2” : Wake me when it’s over. “Kung Fu Panda 2” is one of the most beautiful animated films ever, with fantastic action scenes, astonishingly detailed “sets” and a filmic sense worthy of any live-action epic. It’s a good thing it’s so gorgeous, because dramatically it’s pretty much a wash.
Not awful. But not memorable.